My favorite part of creating a DIY costume for my dog is taking a cute costume I've seen on kids and re-imagining it for my dog, Jensen. I have been planning since last year to do a gumball machine costume this Halloween. 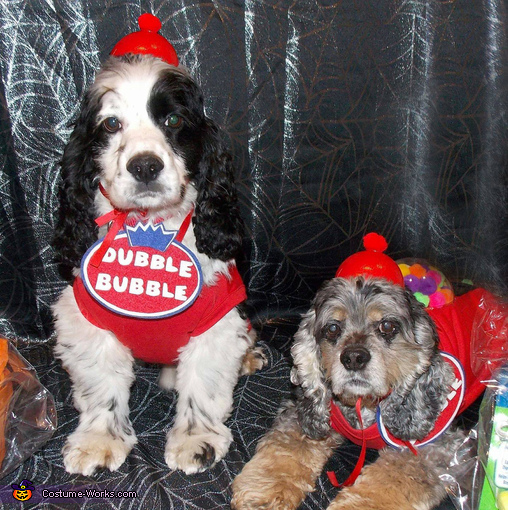 In July, when I adopted a new dog, Tenley, the dubble bubble gumball costume idea became even more perfect because now I had dubble dogs to do the dubble bubble costume. The toughest part of these costumes was finding the right item to use as the dome for the gumball machine. I tried several different things (bowls, clear plastic tins for flower pots, etc.) before finding just the right item. To make the costumes, I glued 1 inch multi colored pompoms to the a red T-shirt in the shape of a circle. I then used large clear plastic fillable ornaments for the dome gluing it over the pompoms. Because these were ornaments, there was an extra little tab piece where a hook normally goes - I just put this little tab at the bottom and then covered it up with the silver fabric that became the base of the machine. I then used items from around the house to make the machine mechanisms like a round ended knife and a soda bottle cap to make the knob. I even glued a pompom on the black fabric to make it look like a gumball had just come out of the machine. I used a smaller clear plastic fillable ornament to make the hat -- I painted it red, glued a red pompom to the top and attached ribbons so I could tie it around the dogs' neck. Finally, I made each of the dog a dubble bubble sign by cutting the logo out of red, white, and blue felt. As an added touch, I handmade the front and back of a dime out of cardboard, various shades of gray paper, silver poster board, and silver mirrored letters. I hand drew the facial features on the front of the dime using a real time as a guide. I then glued the dime pieces to the front and back of a re-usable shopping bag that I'd covered in black felt. When I took the dogs to various contests and events dressed in their costumes, I had individually wrapped gumballs in the dime bag that I passed out. These costumes were a huge hit - everyone wanted to get a photo of my pups and get a free gumball. The costumes cost about $40 total to make and I spent a weekend working on them.